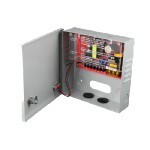 Power Supply, 12 VDC, 5 Amp Continuous, 5A Surge, 8 Electronically fused outputs with LED status Indicators, Lockable Steel case. Colour: Beige, Dim:220x 180x 40mm. Lockable Steel case, 220x 180x 40mm.